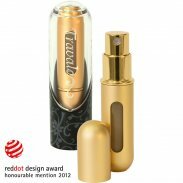 What Travalo Says: Travalo is a refillable atomizer bottle with a difference. Its patented easy fill system allows you to refill in seconds with a simple repeat pump action. Travalo makes it easy and convenient to have a fresh confidence boost any time, anywhere. Directions: Remove the spray head from your perfume bottle. Place your Travalo upright on top of the nozzle peg, and repeatedly pump it up and down to fill. You can tell how much is in your perfume atomizer bottle by the fill level indicator window. Do not overfill! Clearly, I think this little gadget is brilliant. I received my Travalo in the shade “Classic Excel Gold” & I surprisingly don’t mind the shade. Some golds can look kind of cheap, but this has a nice finish. As you can tell by the video, this is extremely easy. All around a fantastic product & a must-have for travel in my book. This particular Travalo comes with a carrying case as well. I found this to be unnecessary but I appreciate it for its packaging & the “just in case” factor. I haven’t had this leak on me once. In fact, I’ve had many other travel sized fragrances crack, spill, leak, & even shatter on me in the past so that’s a huge plus. These are very reasonable & I’m even saving money because I can buy the larger bottles of perfume & not the more compact sizes. They have different prices for different models but the one I have shown here is $20, your average price for a sample of your favorite perfume. I’d like some in more colors so I will be able to tell them apart as well, love the bright shades! Other models range from around $10-$20 & they have some accessories available as well. Have you picked up a Travalo? Thinking about it? What is YOUR most irritating bottle of perfume to travel with? Product provided for review but all opinions expressed are my own. This is seriously a brilliant invention & I want at least 2-3 more of them! Travel: My Mini Fragrances I Brought on Vacation Travel: L’Occitane Verbena Sachet & Fragrance/Gloss Duo! Travel: Where To Get Travel Sized Items Travel: My Pacifica Items Including Solid Fragrances!